We have been in the business of decreasing our carbon footprint since before it became a term. Here at Hanley’s, we believe in using the material that is readily available and recycling it into a new product. All of our work is done by hand and every customer is given the individual and personalized attention they deserve. All new and rebuilt springs are hand hammered, stress relieved and work hardened. 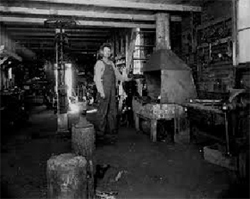 Hanley’s Blacksmith & Spring Shop originated in San Francisco in the 1800’s. After the San Francisco earthquake of 1906, Arthur Hanley moved his family and business to J Street in Sacramento, California. The Blacksmith Shop was then relocated to 1215 G Street. 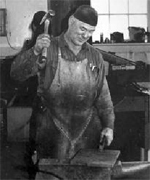 Here Hanley’s served the Sacramento Valley as a blacksmith shop, spring wright shop and wheel wright shop. He manufactured and repaired leaf springs, coil springs, farm equipment, mining and dredging equipment and logging equipment. Due to Sacramento zoning changes, Hanley’s Blacksmith & Spring Shop was forced to move to a new a location in 1987. It was important to keep the operation as original as possible, so the overhead belt system and gas forge were moved and reassembled in a building on 14th Street in Sacramento. Today Hanley’s is located at 8530 Fruitridge Road in Sacramento, California and operated by Shan Maier. Shan has continued to run his business the “old fashioned” way as much as possible. From greeting his customers in person to building or rebuilding his work by hand. Shan specializes in problem solving. His wife, Patty, is behind the scenes keeping the books, doing the advertising and paying the bills. His son, Fred, helps out when needed while attending college.